Did you know that even a minor fender bender can produce a whiplash injury? You may experience not only neck pain but back pain as well. It may take a day or two, or sometimes months for symptoms to appear. It’s vital that you get to our practice as soon as possible for an examination. The longer you wait the more unseen damage there is and the longer it seems to take to recover. Injuries that aren’t treated can result in arthritis in the spine along with chronic headaches and neck pain. Our goal is to get you back to your pre-accident status as soon as possible. Specific chiropractic spinal adjustments can help restore proper motion and position of individual spinal bones, and can help promote proper healing. We also use proper diagnostic testing in the form of X-rays which is critical to establishing a proper treatment program and documentation of car accident injuries. What type of doctor should I see after the accident? If you’ve been seriously hurt, go to the emergency room. If you feel that your injuries don’t require immediate care or you’ve already gone to the emergency room, visit a physician that has experience treating and documenting your injuries. Dr. Timothy O’Grady and his staff have many years of experience and training in treating this type of injury and they’re here to help you. Florida law requires all drivers to carry Personal Injury Protection (PIP) insurance. 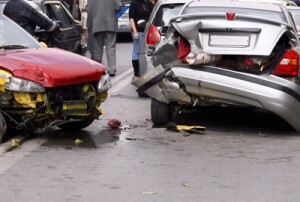 This insurance will cover you for injuries that occur as result of a motor vehicle accident. The at-fault party may also be responsible for some of the medical bills with major medical health insurance helping out. Have more insurance questions? Dr. O’Grady and his staff are happy to help with any insurance questions you may have. It is not required that you retain an attorney to receive treatment. Many people retain an attorney when they have difficulty with insurance questions, have lost wages, a permanent injury, outstanding medical bills, significant pain and suffering or economic lost. This choice is up to you. Dr. O’Grady can provide medical records, final reports and documentation to your attorney upon request. If you need assistance finding an attorney he’ll make a recommendation for a local, experienced attorney to help you. We hope you are never involved in an auto accident. If you are, however, we want you to be prepared so you know what to do afterward. Pull over and call 911. Try to pull your vehicle out of the line of traffic, turn your car off and your hazard lights on. Even if it appears that no one was injured and damage to vehicles appears minimal, call 911 (The federal government’s website, 911.gov believes it’s important to get the police report and it’s critical when receiving insurance coverage in Florida). Exchange auto insurance information with the other parties involved in the accident. Your insurance company and the other driver’s insurance company need everyone’s contact information to decide who pays for the damage. The sooner the insurance companies get this information the sooner the process can start. Also, get contact information such as a copy of the other party’s driver’s license (take a photo with your smartphone if possible). Get a police report. Be sure to give an accurate and detailed report to the police when they arrive. Get a copy of the report and check it for accuracy when the report is released. Police reports are typically ready within 72 hours. You can file a police report later (it varies from state to state, but many states allow up to 72 hours). But, if both cars leave the scene, the information won’t be as accurate and the other driver my give a different interpretation of what happened (especially if they are at fault). Take photos and gather witnesses. Use your smartphone to take photos and video of the scene before the cars are moved, if possible. Also take photos of the damage of all vehicles involved. If eyewitnesses are available get their contact information for later use. Tell the truth. Even if you’re at fault, tell the truth. Stick to the facts, but don’t offer your opinion. Take the time to process in your mind what just happened before you speak. If you aren’t sure of specific details, don’t offer any. If you’ve experienced an auto accident, don’t delay seeking care. Contact us today to book an appointment.